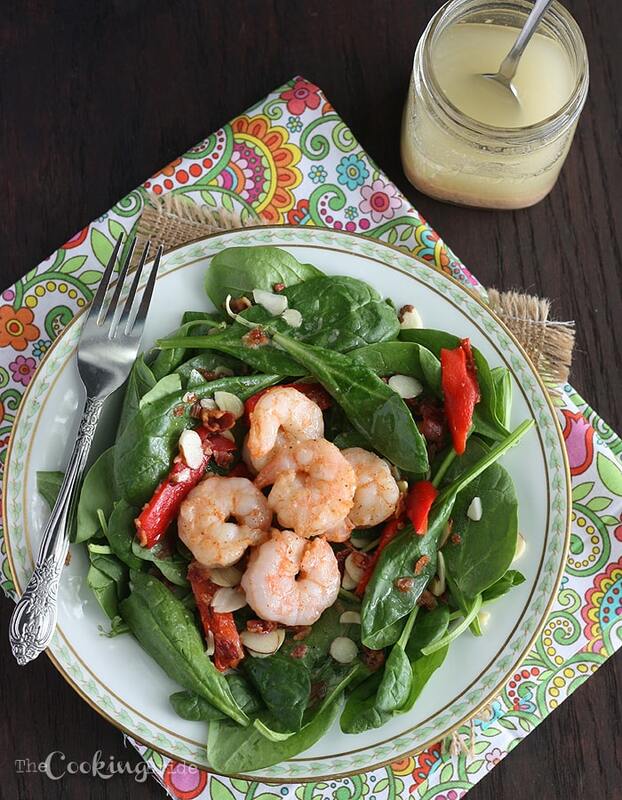 Succulent grilled shrimp salad is served over a bed of crisp fresh spinach leaves and drizzled with a vinegar based hot bacon dressing. In a former life, I worked in the office of a company that manufactured file folders. It was my first introduction to a cubicle jungle – rows of identical grey partitions, giving each of us a false sense of space without really allowing us any privacy. When the only thing separating you from your co-worker is a two-inch metal wall that barely comes to standing eye-level, you can’t help but get to know them in some respect. G was a boisterous Louisiana transplant with a Cajun accent who never met a stranger and wasn’t going to let me hide quietly in my manufactured metal cube. L’s short, dark hair gave off the impression that she was something completely different than what she actually was, which was quiet and soft spoken. Let me just clarify – L was the smoker although she really wanted to quit. G and I just used her smoke breaks as an opportunity to step out of our grey partitions and get some fresh air, or I guess as fresh as you can get in the presence secondhand smoke. Someone would get up from their desk and all they had to say was, “Smoke break.” The sound of office chairs rolling back from their rightful spot and the creaking of plastic as the chair gave up the warm body of its owner always followed. Soon we were stumbling out into the blinding sunlight of the gravel parking lot out front. For fifteen minutes, or however long it took for L to finish her cigarette, we sat at one lonely picnic table placed sort of as an afterthought in the white metal alley between the office and the warehouse. There was a little shade and an occasional breeze. In August, you were painfully aware of how much hotter it had gotten just since July. In January, you tucked yourself between the two buildings in an effort to escape the stinging wind chill. It was there in that alley we talked about life, family, kids, marriage, bills, or whatever. Really bad days – or a really engaging conversation – called for two cigarettes. I sometimes wonder if we didn’t somehow contribute to L’s inability to kick her habit. On birthdays, we piled into someone’s car and trekked over to the local Applebee’s for lunch. Hardly glamorous, I know, but the prices were reasonable and one of us could pick up the tab for the person who’s birthday we were celebrating. 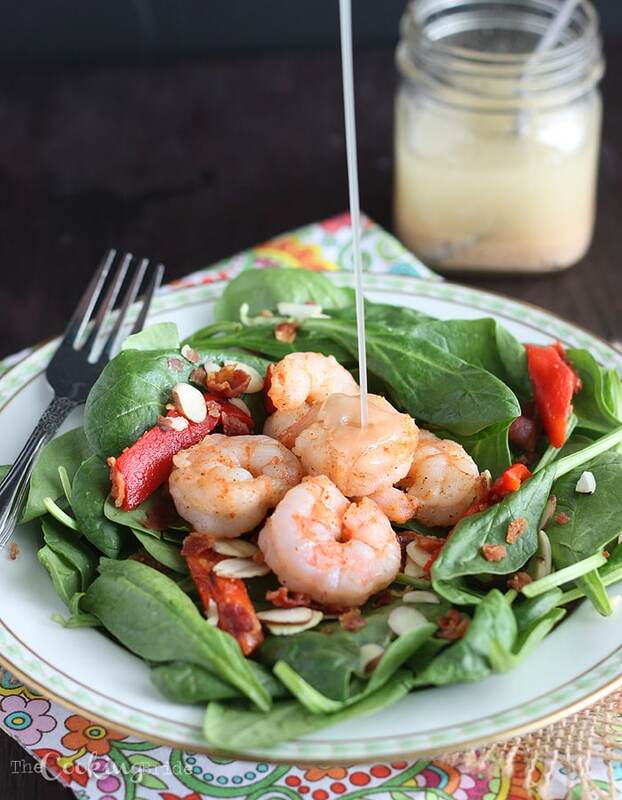 I always ordered the same thing from the menu – a cup of tomato basil soup and the grilled shrimp and spinach salad. If there was any room leftover, we split a dessert – birthday girl’s choice. The three of us kept in touch briefly after I left the company to take another job. However, when I moved to a different city a few months later we rarely saw each other after that. The company eventually closed its doors – like so many businesses seem to be doing lately – and G and L went their separate ways. I still keep up with G through Facebook, but I haven’t seen L in years. On particularly rough days, I find myself wishing for a smoke break chat. And every year when one of our birthdays comes around, I think about three of us beating the August heat in the air-conditioned dining room of Applebee’s and splitting a dessert. Cook bacon in a large skillet over medium heat until crisp. Reserve bacon grease and set aside. Coarsely chop bacon. Add enough vegetable oil to the reserved bacon grease to make 1 cup. Add red wine vinegar, mustard, salt, and black pepper and whisk to combine. Heat mixture in a small saucepan until warm. Prepare a grill for indirect heat. Thread shrimp on a skewer or place in a grilling basket. Brush both sides of the shrimp with olive oil and season with Cajun seasoning. Place on the cool side of the grill and cook until they just begin to turn pink and opaque, about 3-5 minutes per side. 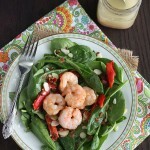 Remove shrimp from heat and set aside. 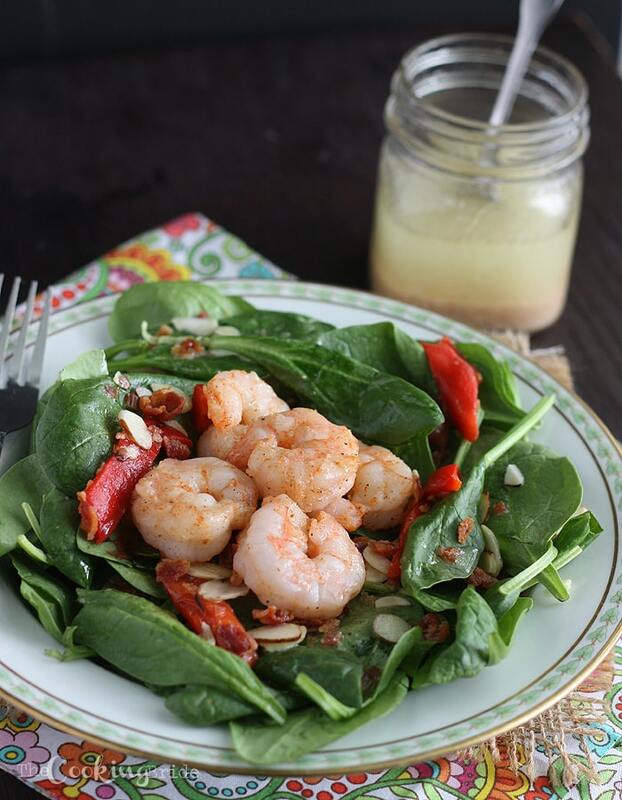 Place 2 cups of spinach on each plate. Divide roasted red peppers and almonds between all four plates. Sprinkle with chopped bacon. Then divide remaining shrimp. 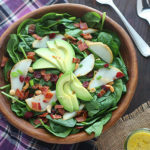 Finish salad with a generous drizzle of hot bacon dressing. I’m sorry, we made the dressing to the “T” and it was absolutely horrible!!! It did not taste anything like Applebee’s dressing, all we tasted was oil and bitterness. Sorry you didn’t have any luck with the recipe, Patricia. 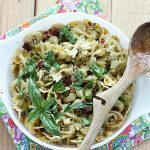 I make this salad several times a year. We enjoy it. I’m so glad you enjoy it, Sherry!